The other drilling muds were bench-scale tested for chemical conditioning and dewaterability. They represented the basic drilling-mud system used in land operations and the typical inhibitive drilling muds for drilling unstable holes. The system did not contain such conventional thinners as lignite or chrome lignosulfonates. Instead, a low-molecular-weight polyacrylate was used for viscosity control. Inhibitive properties of this system were provided by the other polymeric agent, partially hydrolyzed polyacrylamide. Samples of all drilling m\lds tested were collected at the drilling sites from the flowline mud after it passed the shale-shaker. 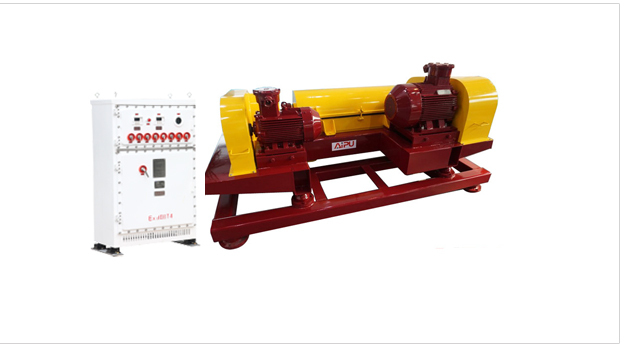 Traditionally, the solids-control system on drilling rigs was considered one of several factors controlling drilling-fluid properties i.e., solids concentration and viscosity. The disintegrating effect of pumping installation on flocculated suspension. Sensitivity of the process to various dosages of flocculant. Advantage of the primary removal oflarger solids before they enter the dewatering system. Process response to its mechanical variables. Control of solids concentration in the dewatering feed by dilution. The best separation results obtained with the two types of centrifuges for the nondispersed drilling mud are shown in Table 2. The mud was easy to treat. A substantial volume reduction of 78 % was achieved. The maximum solids content of the cake discharge, about 45%, seemed to be a limiting value for unweighted systems containing predominantly bentonite and active solids from drilled clay formations with very little sand <2%. The effect of the surface installation was qualitatively investigated by pumping fully flocculated drilling mud through the open-ended flexible hose. The hose discharge was sampled and visually inspected for floc size and strength. The strong effect of pumping on floc quality was noticed. The thoroughly flocculated slurry underwent complete redispersion after passing through the moyno pump, even at the low pumping rate of 10 gal/min [0.04 m3/min]. 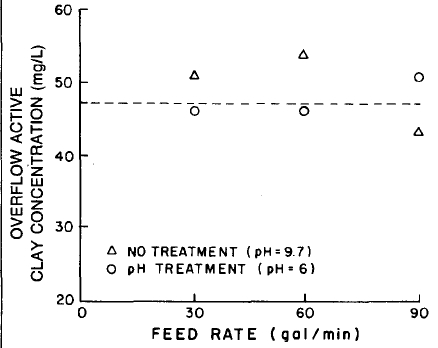 The extra injection of flocculant after the feed pump proved necessary in almost all cases. The other qualitative observation was a decreasing size of the flocs with the increasing pumping rate and extra injection of polymer. The quantitative evaluation of the effect of the field-size equipment on flocculant dosage and cake dryness vs. the bench tests is shown in Table 3. (The bench test was based on mechanical pressing of the flocculated mudcake between two screens over a long period of time until no more cake compression was observed.) The greater consumption of polymer in the field tests can be explained by mechanical disintegration of flocs in the pump and feed line. In addition, Fig. 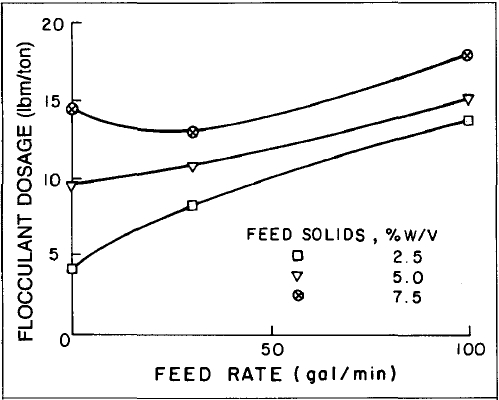 1 illustrates the combined effects of in-line mixing and shearing on the correlations between flocculant dosage and the feed rate. It appears that, at higher solid concentrations, the minimum dosage might be achieved (at the optimum feed rate) by compromising the effects of efficient mixing and minimum shearing. The effect of varying flocculant dosage on the quality of the dewatering process can easily be controlled visually at the centrifuge-effluent discharge point. An insufficient flocculant pumping rate resulted in “dirty” effluent and was counteracted by an increasing flocculant rate. Such control in field operations is not easy, however, because the response of the system to any treatment change is delayed by the time required to pump the whole volume of deflocculated mud out of the system. flocculated drilling mud before the feed pump. The effect of early removal of solids from the drilling mud before its dewatering was investigated in the two-stage centrifuging tests. In the first-stage tests (size classification), the drilling mud was processed through the centrifuge with no chemical conditioning (or with only pH adjustment by ferric sulfate). The results of these tests are shown in Table 4. The typical response of the dewatering system (measured as the effluent solids) to the flocculant injection rate is shown in Fig. 2. The process proved extremely sensitive to small flocculant changes below the optimum treatment point. Hence it seems reasonable to keep treatment slightly above its optimum, sacrificing effluent quality and treatment cost rather than taking the chance of in-line deflocculation. In spite of the initial solids concentration and type of centrifuge, the solids content after the classification run was from 7.7 to 8.9 % and the density stabilized at 8.55 to 8.8 Ibm/gal [1025 to 1054 kg/m3]. Additional classification runs did not make any difference. After the classification run, however, there was a substantial reduction in the flocculant dosage required to obtain jar-test flocculation (taking 30% less polymer to reach a flocculation point). Also, the cake-solids content from the classification run was much higher (66 to 70 wt%) than that from centrifuging with chemical conditioning (40 to 45 wt%). The coagulation before centrifuging did not prove advantageous either III cake dryness or in separation efficiency. As illustrated in Fig 3, .both types of classification runs with and without coagulation did not really remove active colloidal solids from the drilling mud, as evidenced by the methylene blue test. without flocculation. Nondispersed drilling mUd. Altogether, the effect of preclassification proved very advantageous when followed by centrifugal dewatering with flocculation. Not only was flocculant dosage 30% smaller, but an increase (90 gal/min [0.34 m3/min]) of the maximum centrifuge throughput also was observed.